Written by Ted Gioia -- The record label of Billie Holiday and Ella Fitzgerald just got swallowed by a hip-hop business… and no one even noticed! What a strange turn of events! Interscope, founded in 1989 by Jimmy Iovine, first made its mark in the music world as the in-your-face label of gangsta rappers—although later corporate moves have broadened its catalog to include a range of pop and rock acts. Verve, in contrast, started out as a posh home for jazz stars who played the classic songs of George Gershwin, Irving Berlin, Cole Porter, and other craftsman tunesmiths of the Golden Age of America popular music. Even the most optimistic jazz fan must cringe at the prospects of a shotgun marriage between these different organizations with their contrasting traditions. My sources tell me that the organizational shake-up took place quietly some weeks back. David Foster, head of Verve, is still in place, and can rely on newly-appointed general manager Mike Rittberg to help him maintain some independence for the label. But the rank and file of the Verve team have been dismissed. The sales and marketing push behind whatever remains of Verve’s jazz mission—if anything—will be handled by the same folks who are pushing Maroon 5 and Imagine Dragons. Anyone want to guess how much they care about jazz? Frankly, I am not surprised at this turn of events. Norman Granz, who founded Verve Records in 1956, would be horrified by the recent history of his iconic label. Granz worked with most of the major jazz artists of the middle decades of the 20th century. At one time or another, Granz recorded Duke Ellington, Louis Armstrong, Charlie Parker, Dizzy Gillespie, Art Tatum, Stan Getz, Ella Fitzgerald, Billie Holiday, Count Basie, Oscar Peterson and dozens of other now legendary jazz figures. What would Granz think of Verve’s Donny Osmond album “tracing the high and low points of both his professional and personal life”? Or the recent Barry Manilow album on Verve, which finds the pop crooner collaborating with a host of dead musicians? It’s a long path from Billie Holiday to Donny Osmond, and the trajectory is definitely downward. Granz was a tenacious businessman, but he also knew that some things were more important than money. He fought against racial discrimination at every juncture, and refused to compromise in situations where others would have folded. He once confronted an armed policeman trying to plant drugs in Ella Fitzgerald’s dressing room. “I ought to kill you,” threatened the cop, who pointed a gun at the producer’s stomach. Granz responded, “Well, if you’re going to shoot me, I mean, shoot me.” Granz showed similar courage when insisting that a taxi driver operating a “whites only” vehicle give a ride to Fitzgerald, or tearing down the signs for white and black patrons at a jazz concert. Nat Hentoff has called Granz the '”the most stubborn and brusque man I have never known”—but only someone with such fierce determination could have overcome the obstacles facing a music impresario committed to civil rights in the ’40s and ’50s. Verve would benefit today from someone with Granz’s vision and stubbornness. As I look back at Verve’s output in recent years, the most striking aspect is the lack of any consistent guiding principles. Some albums are better than others, but too many decisions seem driven by marketing concepts rather than a commitment to artistry. Even Diana Krall, one of the few high caliber jazz artists still affiliated with Verve, is presented in the crassest way. Her 2012 release, Glad Rag Doll, looked more like an excuse for a lingerie photo shoot than a jazz album. Her latest recording, Wallflower, has a few inspired musical moments, but the focus on tired top 40 pop material from a second-rate oldies playlist—“Alone Again (Naturally),” “Desperado,” “I’m Not in Love”—is cheesy in the extreme. Krall succeeds here despite the song choices; a lesser artist might have lost all credibility in jazz circles with an album of this sort. How could Universal fix Verve? Perhaps they should look back to the steps Norman Granz took to revitalize Ella Fitzgerald’s career in the ’50s—the greatest success story in the history of the Verve label. While under contract to Decca (ironically, now part of the Universal Music empire that controls Verve), she was prodded into recording embarrassing songs such as “Santa Claus Got Stuck in My Chimney” and “Little Man in a Flying Saucer.” But when Granz brought her on board the new Verve label, he packaged and promoted her as the leading jazz interpreter of classic American songs. 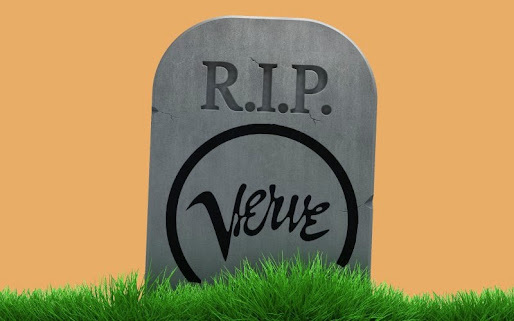 The resulting “Songbook” albums—featuring the music of George Gershwin, Cole Porter, Duke Ellington and others composers of the highest caliber—still serve as the foundation of Verve’s catalog and reputation. That kind of commitment to quality is still the best recipe for long-term success in the jazz field. Throw out the gimmicks. Forget about clever press releases. Instead, back the finest talent and give them a platform to make the best music possible. If Universal Music wants to see how this is done, they should check out the jazz offerings from ECM, Nonesuch, and other labels that have flourished, even during tough times, with a commitment to artistry that starts at the top of the organization. Or, if that is too much to ask from the new team at Interscope, perhaps the best thing for all parties would be to find a new owner for this historic label. Maybe with a different boss, Verve could once again live up to promise embodied by its name.